Written by Forest Pines; published at 8:42 am on May 29th, 2009. Regular readers might recall that recently, we visited the London Zine Symposium, and I mentioned it on here. That post, after lots of rambling about the aristocratic “anarchists” of the zine world, ended with us leaving the zine symposium and heading off into the big city, with no hint of what we might do next. Well: we explored. I took K on a walk something like one I’d done before, from Bankside up past St Pauls, through a deserted Smithfield, past Farringdon and up into Clerkenwell. And on the way, we passed somewhere I wasn’t aware of three years ago when I last passed it. So, we went in. This is: Postman’s Park, right in the centre of the City, on King Edward St; a 19th-century park made from former graveyards and churchyards which abutted each other. A small patch of green. 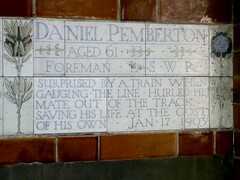 I’d heard about it from Nothing To See Here, which has featured Postman’s Park and its most distinctive feature. The Watts Memorial, to commemorate the bravery of ordinary people. 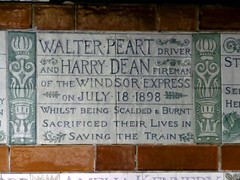 It consists of 47 tile plaques, under a lean-to shelter, commemorating ordinary people who died saving the lives of others, in the 19th and early 20th centuries. The painter G F Watts created it, from the late 1880s onwards; he delved into the archives for some of the plaques, commemorating deaths from 25 years earlier. 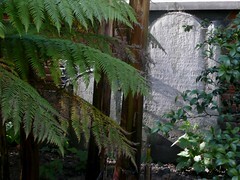 The rest of the park has its own air of strangeness, being lined with headstones dating from its days as a group of churchyards. Especially on a summer Sunday evening, it is a quietly mysterious place, the art-nouveau plaques of the memorial lending it a subtle neogothic touch.